Thank you for last comment you gave.I am novice. Hope you do not mind. So this my next item (bowl ?). Is this antique and what it is model name?. Thank you again for your time. Thank you for your effort and caution. It is mine. I feel grateful. Is this yours? If yes, I would put it away and wait until you get an opportunity to have a porcelain expert of a museum, or a member of an oriental ceramics society, etc. inspect it in person. It is not possible to tell authenticity 100% from pictures alone. Saying it straightforward, this looks like Yuan dynasty blue and white porcelain. I mean that it is possibly late Yuan or early Ming. Please be aware that there are lots of high quality fakes out there, especially in Indonesia. And I have taken the liberty to ask a collector more experienced than me about this, and he is of the same view. So, this likely is either Yuan or early Ming dynasty. To me the indication that it could be early Ming is the rounded should of the stylized lotus petals on the underside of the bowl. Otherwise it looks all Yuan. We can see such items only behind glass in the museums. All features are in accordance with typical porcelain of that period. 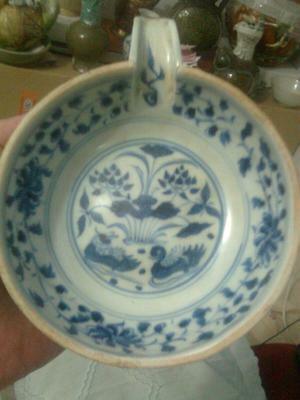 First of all, the blue color seems to conform to the imported Sumari pigment used in the Yuan and early Ming dynasties. In some places the color gets a bit dispersed along the edge (on the underside), which also happens with Sumari pigments. The many small recessed spots are also a feature of this. The underside decoration could be Yuan dynasty or early Ming, in my view. The duck and leaf decoration is a Yuan decoration that is frequently found. This might be valuable. Please be careful with this.